THE LAST MAGAZINE – The twenty-year-old maven Odeya Rush is having a moment. Ten years after moving from Israel to the United States and starting her career with modeling work and acting classes, her latest role as Jenna in Greta Gerwig’s celebrated new film Lady Bird has put her on the map, and, with a number of upcoming movies, the young actress is one to watch. “I’m a huge Greta fan,” says Rush. “Her writing is so smart. Each character has their own world.” In the Gerwig’s directorial début, this hyper-real world is centered around a girl named Lady Bird (Saoirse Ronan) and her last year at a Catholic high school in northern California, focusing on her relationships with her peers, her family, and especially her mother. Starring as the archetypal mean girl, Rush plays a snooty and out-of-touch teenager, whose favor Lady Bird seeks to get close to bad-boy love interest Kyle (Timothée Chalamet). Jenna cuts class and hems her skirt too short, scoffing at teachers and driving a car much too nice for a seventeen-year-old. An unlikely friendship builds between the two girls as Lady Bird finds her way into Jenna’s clique. Her ambitions, unlike Lady Bird’s, start and end on the right side of the tracks in Sacramento. Eventually Lady Bird’s lies about her family and background come to the forefront when Jenna makes a surprise visit to her house, discovering her true background, and their friendship unravels. Having already acted in a number of movies—including a lead role opposite Meryl Streep, Jeff Bridges, and Alexander Skarsgård in The Giver—Rush stresses the importance of a positive relationship with the film’s director. “When it comes to acting roles, it all has to do with the director,” she says. “I’ve realized that over time.” Her experience with Geriwg on set was eye-opening and life-changing. “There is something really relaxing about a female director,” Rush explains. “I want to keep working with female directors and the directors that I admire the work of, learning from them. That changes everything, who’s leading you, being inspired by them, the energy they put on set. I find that when I’m comfortable and inspired, I’m able to take more risks.” In that vein, Rush just wrapped Dumplin’, a film directed by Ann Fletcher, of The Proposal and Step Up, starring alongside Danielle Macdonald and Jennifer Aniston. The now-seasoned actress continues to enjoy being in front of the camera, but also has bigger desires to direct and write. It is fitting that her connection to roles through directors has led her to want to go behind the scenes, finding inspiration in the strong female directors that she’s worked with. Having already directed a few shorts, she plans to continue with more whenever her busy acting career allows. While in Los Angeles, Rush tries to stay pretty low-key, having just moved into her own place. “Every morning I meditate. I drum or paint,” she says. “I think you have to, as an actor, find outlets for creativity that don’t come with pressure attached.” On off days, she is in many ways an average Angeleno, spending her time vintage shopping and writing in cafes. She says she finds inspiration in the city’s diversity, seeing how others express themselves and the open-mindedness they possess. Although Los Angeles is Rush’s current base, she still feels deeply connected to her country of birth, Israel. Although she moved to the United States with her father at age nine—with her mother and four of her brothers joining them a few years later—a big portion of her family still resides in Haifa. “There’s something about being in Israel that always feels like home,” she says. “It’s a genuine place, people are so real there. They are community- and life-centered.” In fact, Israel serves as the inspiration for the short she is currently working on, about a bike ride through Tel Aviv. Showcasing the city’s many neighborhoods and offering up an alternative perspective of her country that’s different from what is constantly portrayed on the news, it promises to reveal almost as many facets as its multitalented director has. Lady Bird is out now. Charlie & Amber’s First Kiss – ‘Almost Friends’ Teaser! Nov 9th, 2017 Comments Off on Charlie & Amber’s First Kiss – ‘Almost Friends’ Teaser! JUSTJARED.COM – Freddie Highmore and Odeya Rush are getting close in Almost Friends, and JustJared.com is bringing you an exclusive sneak peek of the upcoming movie! Watch as Charlie (Highmore) and Amber (Rush) share an intense and passionate first kiss, only to be interrupted.. Almost Friends is a coming-of-age film that also stars Haley Joel Osment, Marg Helgenberger and Chris Meloni, written and directed by Jake Goldberger. Once a promising young chef, Charlie (Highmore) is now an unmotivated twenty-something who lives at home with his mom (Helgenberger) and stepfather while working at a small movie theatre and living vicariously through his best friend, Ben (Osment). His life takes an unpredictable turn however, when he finds himself falling for local barista Amber (Rush). Almost Friends will be released on November 17 in theaters and On Demand. Watch the exclusive clip below! Almost Friends arrives in theaters and On Demand on Nov. 17. Once a promising young chef, Charlie is now an unmotivated twenty-something who lives at home with his mom and stepfather while working at a small movie theatre and living vicariously through his best friend, Ben. His life takes an unpredictable turn however, when he finds himself falling for local barista Amber. Problem is, Amber has her own distractions — her mooching roommate, a track star boyfriend and steadfast plans to move to New York City. On top of that, Charlie’s estranged father unexpectedly re-enters his life just as he begins to take a long, hard look at where he’s going and who he wants to be. With conflict after conflict piling on, will Charlie reach his tipping point or will he finally find the path forward? 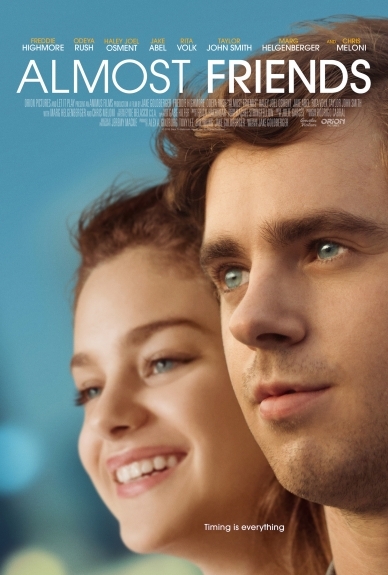 Freddie Highmore (The Good Doctor) leads the cast of Almost Friends, which will have a day-and-date release of Nov. 17 theatrically and on VOD. The other stars include Marg Helgenberger (CSI), Haley Joel Osment, Odeya Rush (Goosebumps), Jake Abel (Love & Mercy), Taylor John Smith (Wolves) and Christopher Meloni (Law and Order: SVU). The film follows a once promising young chef, Charlie who is now an unmotivated twenty-something living at home with his mom and stepfather while working at a small movie theatre and living vicariously through his best friend, Ben. His life takes an unpredictable turn however, when he finds himself falling for local barista Amber. Hi! 1108 bluray screencaptures from the movie The Hunter’s Prayer have been added to the gallery. The Bachelors will be available to rent and own on Digital HD October 20th!